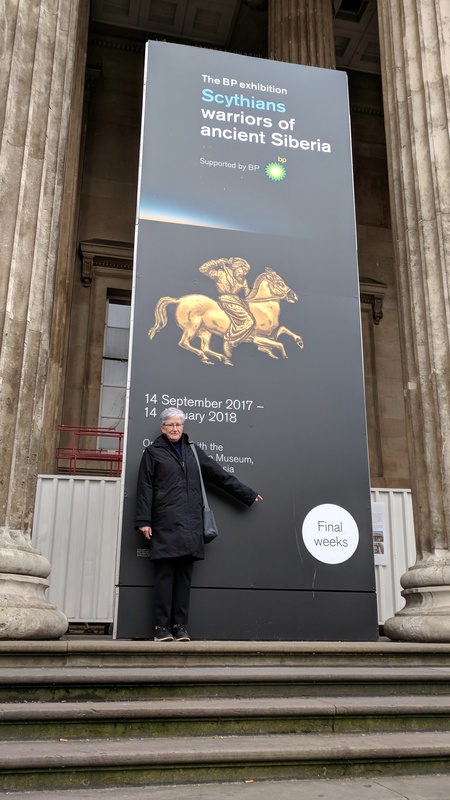 The second day of our weekend was refreshingly dry with bright intervals, so after a hotel breakfast we set off on a short walk to the British Museum and the Scythians. 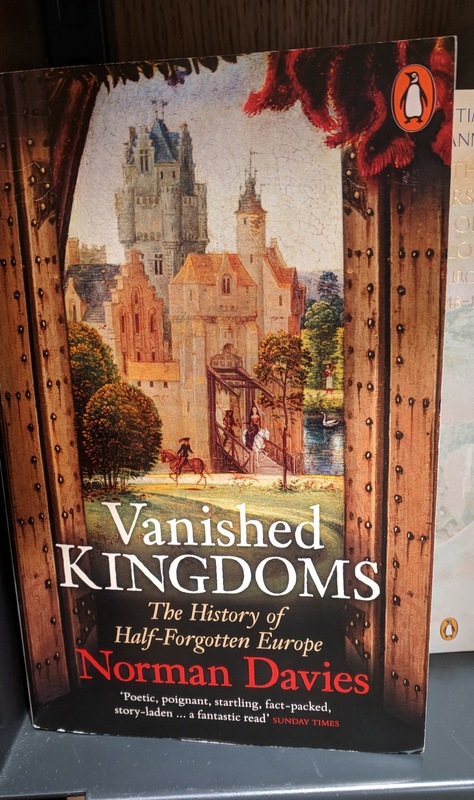 In 2000 I was enchanted by a Scythian exhibit that I saw in San Antonio, prompted by Paul Richard’s stellar review that began, “The Scythians on horseback, especially in sunlight, must have been a sight.” That exhibit led me on a long journey that included the exploits of Alexander the Great and generally led to a fascination with the ancient world. I couldn’t wait to see this new exhibit that included many newly discovered objects and information. 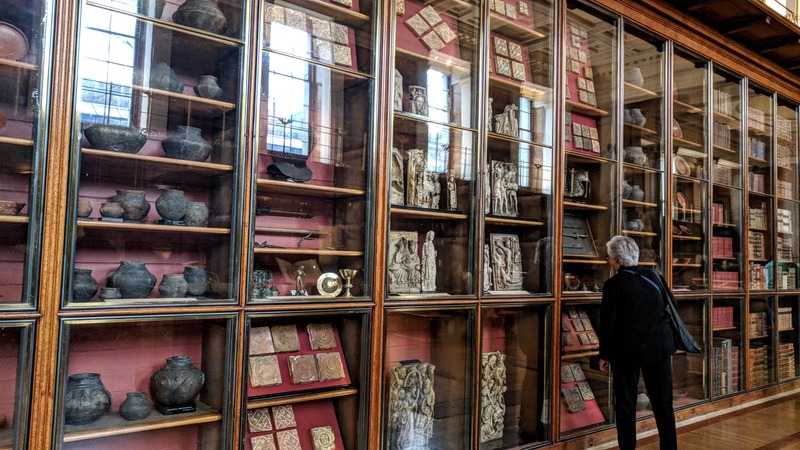 Before we met the Scythians, we visited the Enlightenment Rooms. Here are galleries set up as in the old days, with lots of cases filled with lots of things. Here is Alison taking a gander. 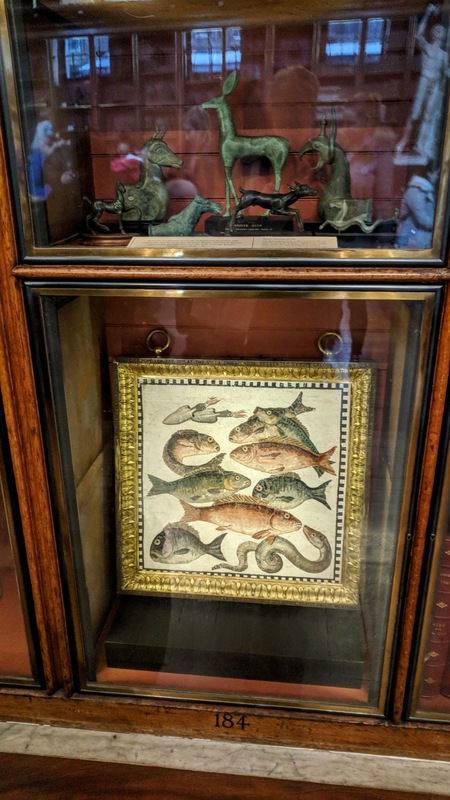 And here is a closeup of one of the wonderful collections. It was a lovely wander as we waited for our timed ticket entry. Because they did not allow photos in the exhibit, and because I am a dutiful citizen, I have no pictures of my own. But here are a few gleaned from the web. The Scythians are known primarily from their elaborate burial mounds, as well as from the sometimes misleading information about them from Herodotus. 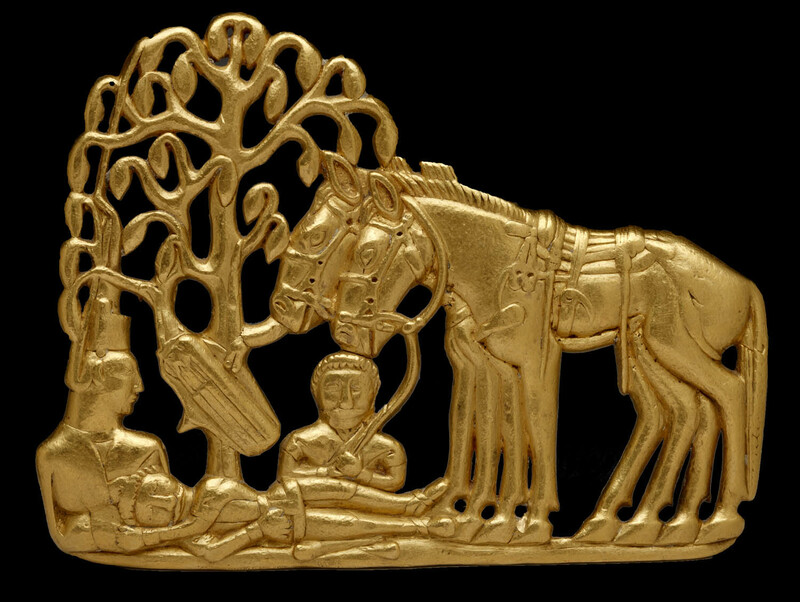 Nomadic horseman with a taste for gold, they buried gorgeous items like this, half of a symmetrical belt buckle. 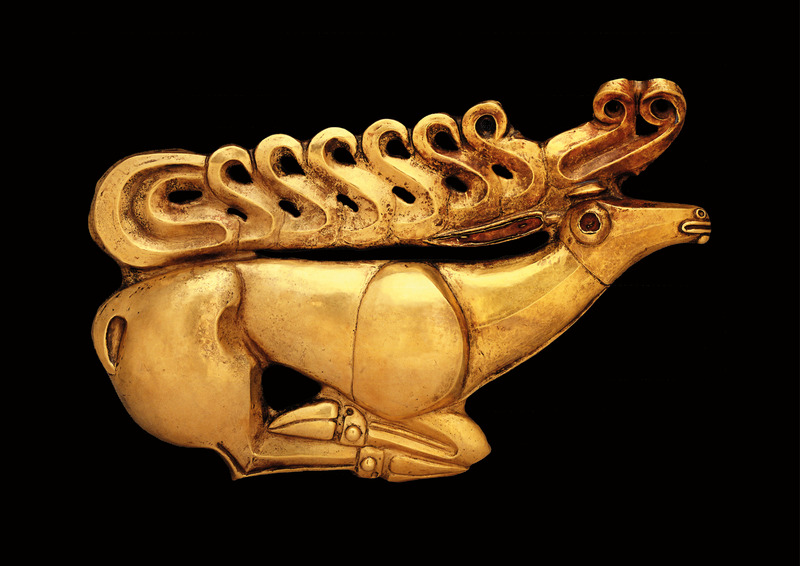 The Hermitage lent this lovely deer figurine in a typical Scythian style. 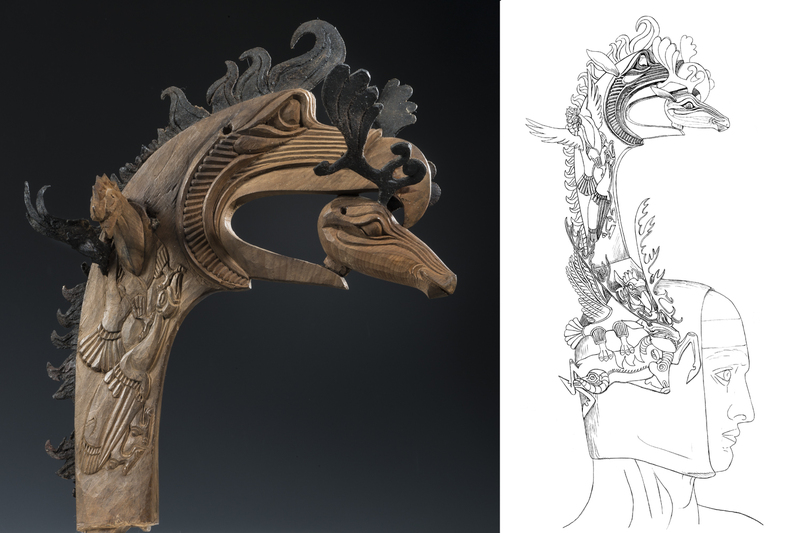 Amazingly, some wooden objects have survived, including this elaborate headgear with a drawing that helps you to see how it would have been worn. They were fierce warriors, terrific horseman, and fond of drinking and inhaling hemp smoke. 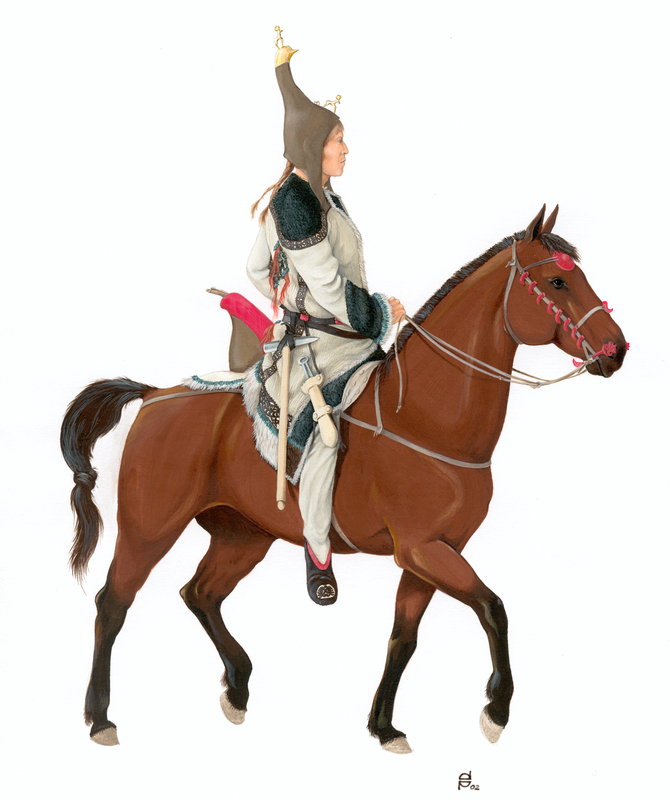 Here’s a lovely picture of what a Scythian horseman might have looked like. Notice the lack of stirrups, which didn’t hold them back. Since burial mounds are continuing to be discovered and investigated, our knowledge of the Scythians continues to grow. But for now, this exhibit, drawing on collections from around the world, offers the best and most recent information. 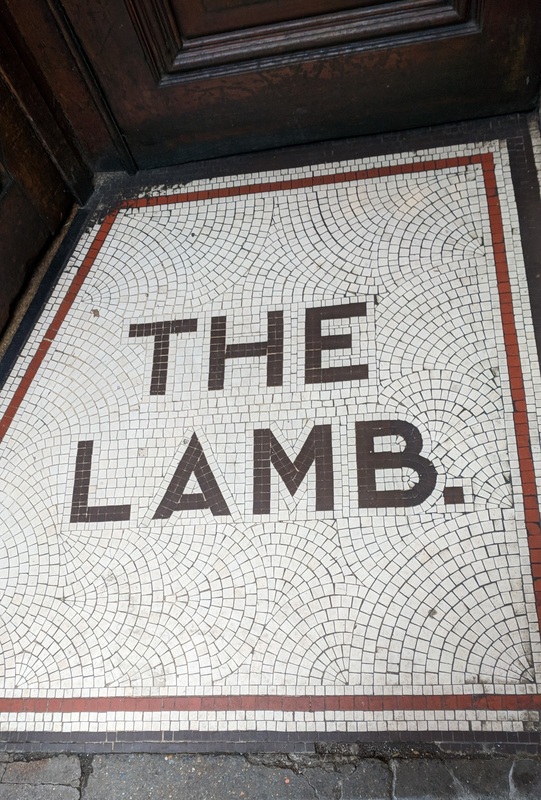 For lunch, we met Judy and her dear friend Beth at The Lamb, a pub that promised to be old and authentic. The entrance was certainly promising. 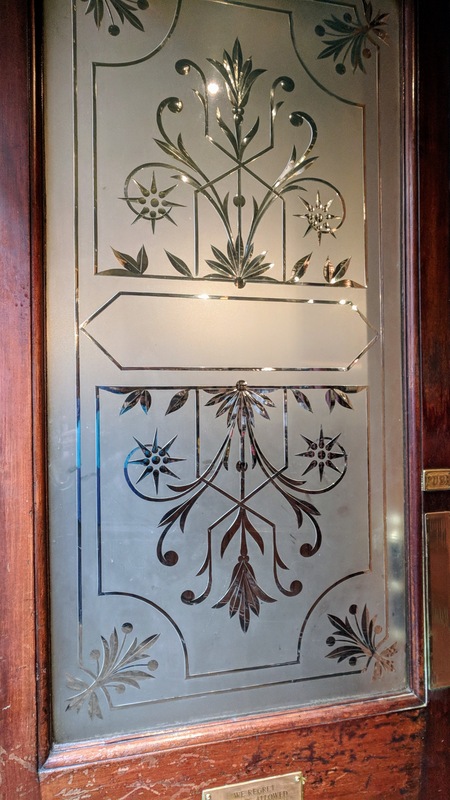 Inside, it’s famous for its etched glass that separates the upper from lower classes. How did I not get a picture of these two?? 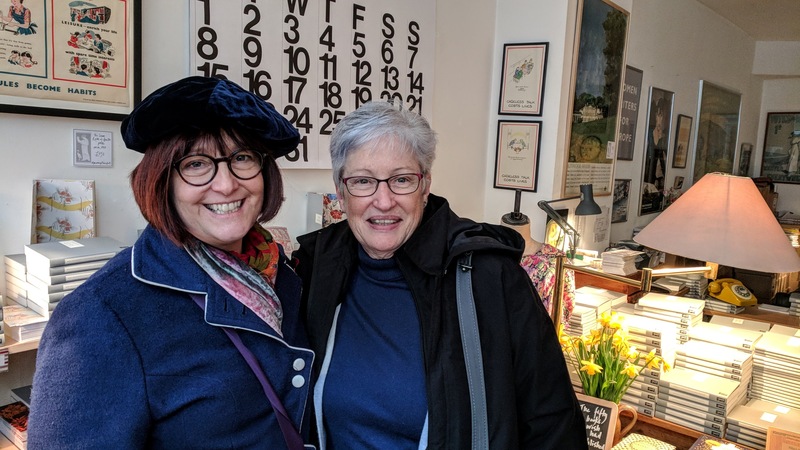 It was so much fun to talk with Beth, whom I hadn’t seen in years, and to hear about their adventures and plans. 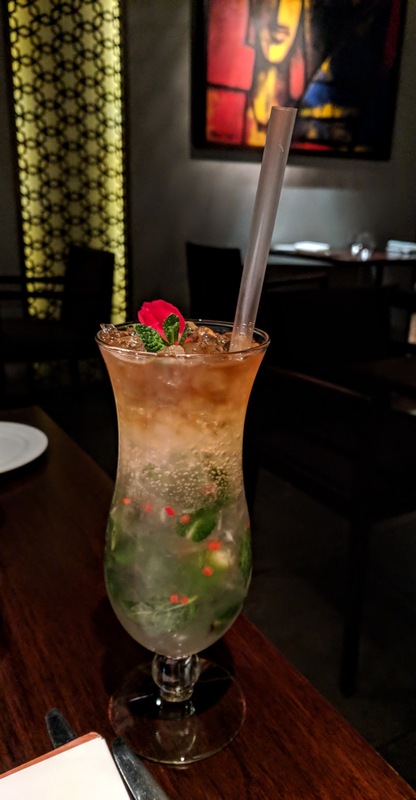 We had a good lunch with a half pint of something local, and then wandered on to Persephone Books, where we browsed through the shelves of twentieth century women writers but didn’t buy anything. 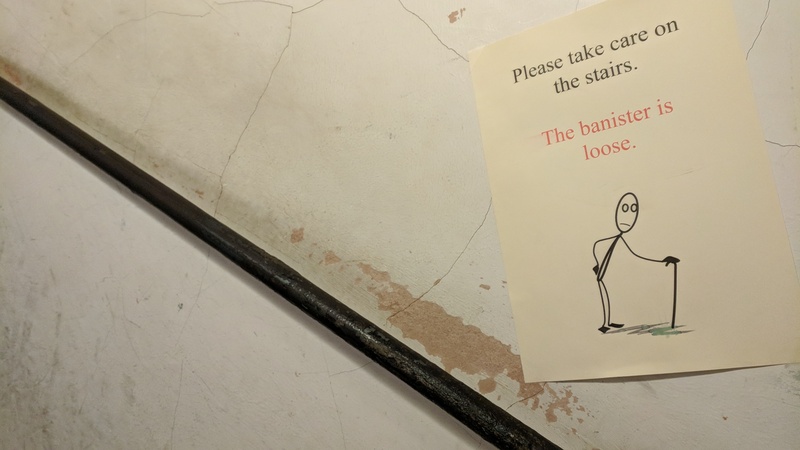 Better to spend the time making a sign rather than actually fixing the banister! We stopped at both Quintos and Henry Pordes Books, at the latter of which Alison snapped up a signed paperback by John Steinbeck for Michael. 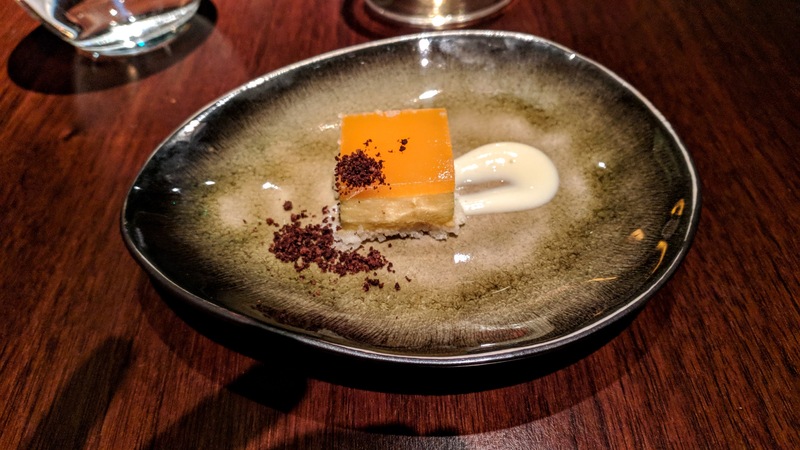 Tonight was our splurge at an Indian restaurant, Quilon, where we enjoyed a Qojito, oysters, lamb shank, duck breast, lemon rice, Malabar paratha and this lovely dessert. 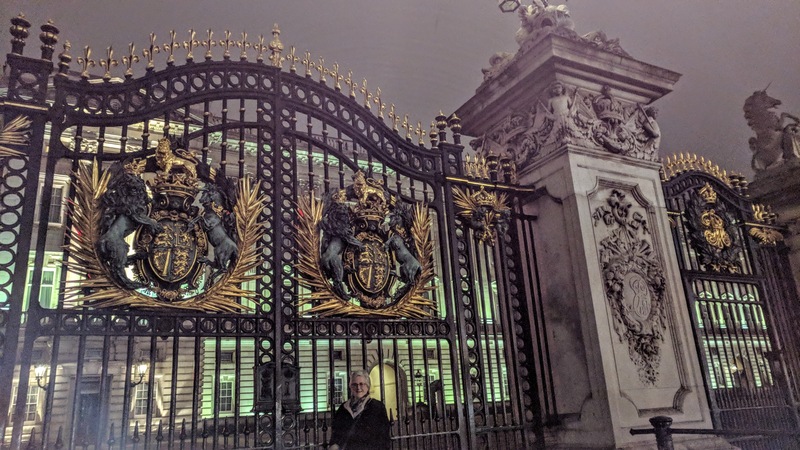 We decided to walk back to the hotel and on the way paid a visit to the Queen – unfortunately, she was not at home, but Alison made her best attempt.